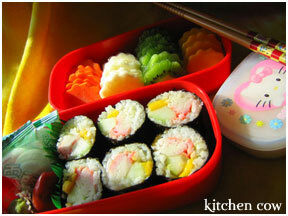 Recently, preparing bento has been an elusive task, as shown by the absence of updates here. A sorry state that I’d like to correct because I have more reasons to prepare bento now that we’ve moved offices and there are less options for buying lunch. So I think a reminder post on why bento wins is called for—to give me that necessary push to go back to bento. 1. It’s cheaper. I know, I know. Being obsessed with bento can be expensive, seeing how I own more than 20 bento boxes. I confess to spending a couple of hundred dollars already on bento paraphernalia, but then, those aren’t necessities. If I just count the food costs, packing bento still translates to cheaper lunches. 2. It’s convenient. Having your lunch ready saves you time because the perennial question of “Where do we eat?” is solved. 3. It’s yummy! My bento always has to be delicious because I’m the one who’ll eat it! Personally, I always prioritize taste over cuteness because it’s something I’ll eat. If it’s not something I’ll want to eat undecorated on a plate, chances are, it won’t go into my bento. 4. O hai! I can has cute fud? Rly?1 Cute food makes my day. While I don’t prepare kyaraben2 all that often, on days that I do, it brings a smile on my face. 5. It’s healthier. When preparing bento, I try to balance the contents between carbs, proteins and lots of fruits and veggies. While I’m not always successful, all in, it’s still a concrete effort to be a little bit healthier. 7. I get to experiment on new dishes. Because I’m mostly cooking for myself, there’s no fear about wasting food in case a new recipe or an experiment goes haywire. And if it’s a success, I learn something new! 8. It’s a reason to blog! I know there’s been a dearth of blog posts here lately so I just hope this resolution will push me to prepare bento more, and update more often. Now it’s your turn. What are your reasons for packing lunch? 1 lolcat â€“ cat macros, popularly referred to as lolcats are pictures of animals, most popularly cats, with quotes in fragmented English superimposed on them. One of my favorite lolcat sites is http://icanhascheezburger.com/. 2 kyaraben â€“ (character bento) Bento with characters from anime, manga, or sometimes, even celebrities on them. This entry was posted in take a tip. Bookmark the permalink. 14 Responses to Why Bento? I have about the same reasons to bring bento as you. Recently I’ve put health in the foreground to my reasoning though. First, the lunch restaurants here use a much larger amount of fat – it’s just that much easier to cook quickly and tasty if you add lots of it. And second, the portion size. A lot of places here have buffets, and I can’t control myself not to overeat there. With a bento (though I bring my larger boxes these days), I have enough to get full but not stuffed. Your reasons are good ones, and I agree with affordable, and healthier. I also find I eat more variety when making bentos. I have to bring my lunch to work, because I don’t drive and going out is not a realistic option. I work at a school and it has a cafeteria, but they never change their menu and eating there every day would be stupendously dull, not to mention expensive. 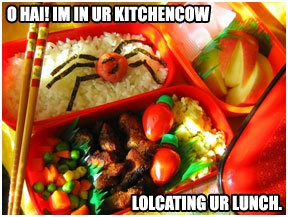 I started bentoing as a way to make a necessary chore more fun and interesting. It’s nice to have that break in the middle of the day where you sit down to your lunch and it’s not just a sandwich and chips. It’s like getting a little present from yourself. grabe! bilib tlaga ko sa yo. ang tyaga mo gumawa ng bento! they’re so pleasing to the eye, parang nakakahinayang kainin kse mawawala na ung design. hehe! it’s really an art form! keep it up! looking forward to more of your bento posts! Hello kaoko. This is my first time replying your post after reading this blog for a while. Me too always bring my lunch box to the office. Here, we have a very small cafeteria withe an awful lunch that I cannot resist. Also, I have to manage my very tight budget each month, so bringing my lunch from home is the best thing for this situation. I love your blog and your creative menu, Also, your lovely doll family ^_^ Your blog makes me smile everytime I come to visit. I was a packed lunch girl when I was growing up, mostly because my mom was fearful that I’d eat something unhealthy. When I got to highschool (height of my weeabo years), I was given my first bento box, a hello kitty bento box from gift gate. Unfortunately I stopped packing lunch in college as it was hard given I had to bring so many things along with me, but got back to packing baon on bento style boxes when I worked in the office. It wasn’t until recently that I started collecting bento boxes (I got my J-list delivery just yesterday), unfortunately I work at home now so I don’t do baon any more XD. I should take a leaf from your book and start eating healthier as well, but sadly I’m too addicted to unhealthy food. Oooh! How could I have forgotten that reason! I agree, it’s a very interesting creative outlet. Thanks, glad you enjoy it. Buti na lang, when I’m hungry I just eat, regardless of how my lunch looks. Otherwise, I’d be wasting food. It’s unfortunate that a lot of people suffer from awful cafeteria food. And in your case, wow, I can’t imagine how anyone can get Garlic Bread wrong! Good enough reason to keep bento-ing! Irasshaimase! Gift Gate? You’re Filipino as well? Hehe, collecting bento boxes is addictive isn’t it? Why not put the collection to good use? I know some people who work from home who still pack bento in the morning, then stash it in the fridge. She says it’s because it keeps her on track with her daily schedule because come lunch time, she just has to grab it from the fridge, without breaking her working pace. And well, it’s a nice excuse to prepare pretty food, hehehe. Oh you should join Lasang Pinoy 25, girl. It’s all about bento! Looking at your header and seeing that flower-shaped kiwi, I can’t help but wonder what you do with the cutouts? Do you throw them away, eat them, or stuff them at the bottom of the box? I’m thinking wastage is a challenge too in making bento, so how do you avoid that? Two things. I either eat them while prepping *slice, cut, eat, slice, cut eat* or I hide them at the bottom. I agree with you, food is too precious to waste.